The second class of students enrolled in the PKU-UCLA Integrated BS+MS "3+2" Program graduated in June 2016. Five students received their MS from UCLA and are taking positions across the tech industry in the US and in China. Recent graduate Jiayao Li stated, "After completing the 3+2 program, I am employed by Google as a software engineer. I believe that what I learned while at UCLA will be of great help in my career." Han Wang mentioned how the program helped her realize her desire to change majors and career trajectory, "My major was Electrical Engineering at Peking University, but the course CS174A here arose my interest in Computer Science and this program makes the transfer quite easy. So I really appreciate this program and also love the studying experience in UCLA." In UCLA's first accelerated degree program. 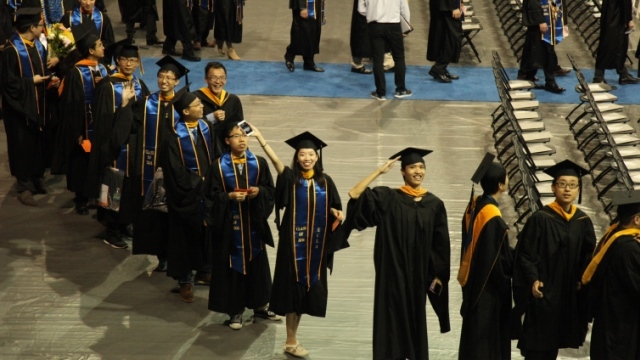 PKU students attend UCLA for their fourth year of undergraduate studies, receive their PKU Bachelor's (BS) degree, then continue on for one more year at UCLA and receive a UCLA Master's (MS) degree. Learn more about how to apply to the program here: http://www.pku-jri.ucla.edu/jri/article/150479. We would like to acknowledge the special support provided by the California NanoSystems Institute at UCLA.